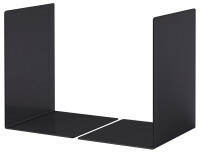 Set of 5 elegant magazine racks. 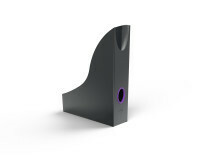 Grip holes in different colours for easy orientation and optimal handling. Attractive drawer box with 5 drawers. With coloured grip areas for easy organisation of documents and files. 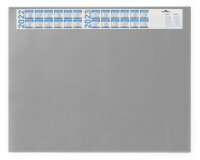 Crystal-clear, anti-glare overlay for desk mat Art. 7205. Attractive drawer box with 4 drawers. 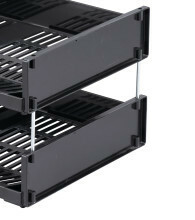 2 XXL-drawers provide extra large storage capacity. Desk mats of premium quality leather with circumferential decorative edge. Set of 2 elegant letter trays. Coloured cut outs with easy access for comfortable orientation. 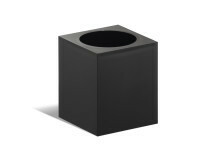 Can be stacked vertically or staggered. Stackable letter tray in A3 landscape format. Can be used with risers (1700132001). The product bears the Blue Angel Ecolabel. Practical pen cup to store pens, scissors, markers etc. Dimensions: Ø 80 mm, height 102 mm. Acrylic dispenser with 125 painted paper clips size 26 mm. Calendar block with 25 sheets with motif print "Bright Curves". Replacement block for desk mat item no. 7314. Standard scissors for paper and textiles. 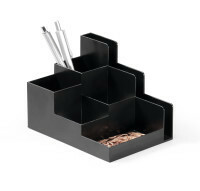 Pen tray for utensil drawers in mobile storage containers or for insertion into the IDEALBOX PLUS drawer box. The product bears the Blue Angel Ecolabel. Attractive drawer box with 3 slimline drawers. 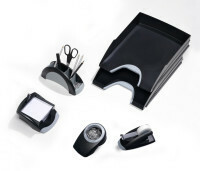 With coloured grip areas for easy organisation of documents and files. 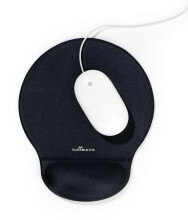 Mouse pad with integrated wrist support, foam underside and fabric surface. Non-slip. Desk mat with calender for 4 years. With an anti-glare and replaceable overlay. Calendar block with 25 sheets with motif print "African Wildlife". Replacement block for desk mat item no. 7313. 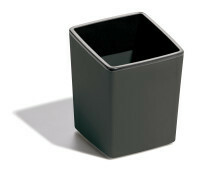 Attractive storage box with 1 coloured drawer in XXL-format. Lockable drawer with cylinder lock. 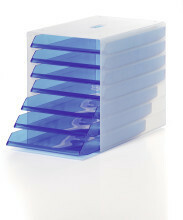 Compact, user-friendly storage tray for desktop or drawer. 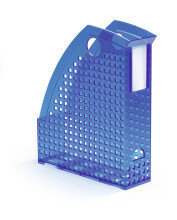 Magazine file for A4 formats with grip hole. The product bears the Blue Angel Ecolabel. 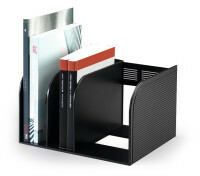 Catalogue file with variably width-adjustable compartment partitions. The product bears the Blue Angel Ecolabel. 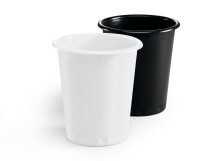 A modern, attractive pen cup made of premium quality plastics for storing everyday stationery items such as pens, scissors, marker pens and pencils. Attractive drawer box with 7 drawers. 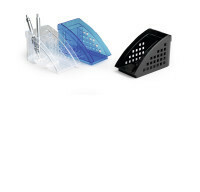 With coloured grip areas for easy organisation of documents and files. Set of 5 elegant letter trays. 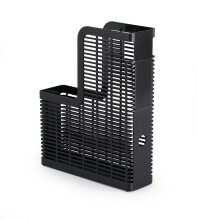 Can be stacked vertically or staggered. Coloured cut outs with easy access for comfortable orientation. High quality, robust an stable design. Attractive drawer box with 10 drawers. 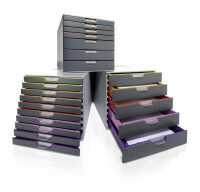 With coloured grip areas for easy organisation of documents and files. Elegant desk mat in premium quality for optimal writing comfort. 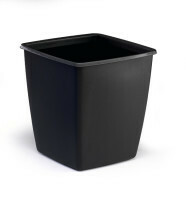 Storage box for filing documents. 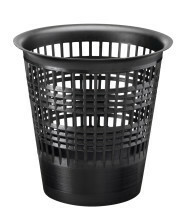 Ideal for storage inside a cupboard. Includes 7 C4 letter trays. Attractive desk mat in trapezoidal shape. 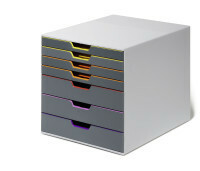 Attractive drawer box with 4 colourful drawers. 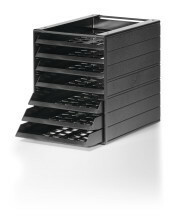 2 XXL-drawers provide extra large storage capacity. The top drawer is lockable. Innovative mobile box for maximum flexibility. Magazine file for magazines in A4 format with grip hole. The product bears the Blue Angel Ecolabel. Stackable letter tray for formats up to C4. The product bears the Blue Angel Ecolabel. Calendar block with 25 sheets with motif print "Pinewood Panels". Replacement block for desk mat item no. 7312. Transparent and anti-glare desk mat. Ideal for underlaying notes etc. 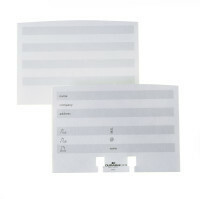 800 blank notes 93 x 93 mm. Refill for NOTE BOX TREND. Desk mat with flexible writing surface and decorative groove. 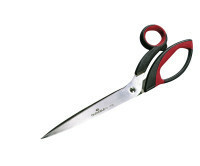 General purpose scissors for card, paper, PVC, material and other rigid materials. 3 year guarantee. 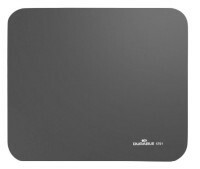 Ergonomically shaped mouse pad with integrated gel-filled wrist support. Calendar block with 25 sheets with motif print "Tropical Beach". Replacement block for desk mat item no. 7311. 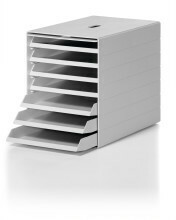 High quality, double rotary card index with 300 double sided business card pockets (72 x 104 mm) for 600 business cards. Attractive desk mat in trapezoidal shape. With transparent overlay. Desk mat with calender for 4 years. With transparent overlay. 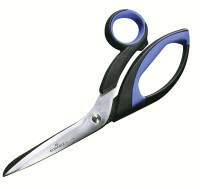 Standard scissors suitable for paper and textiles. 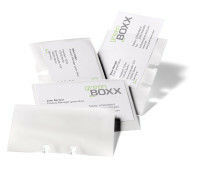 40 transparent business card pockets for VISIFIX flip and VISIFIX desk products. 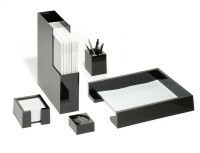 Desk organizer with 5 compartment partitions and an additional compartment for letter envelopes. The product bears the Blue Angel Ecolabel.